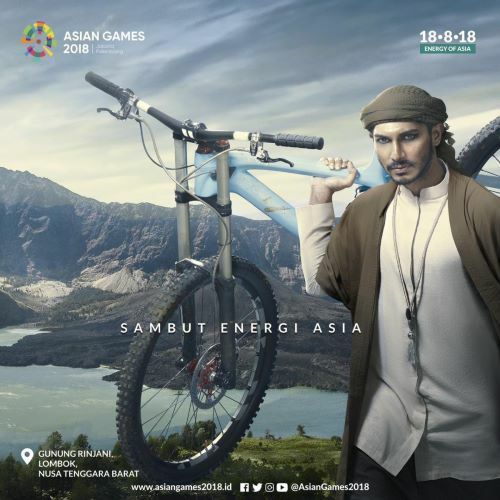 Six popular destinations from different parts of the country are featured on images to promote Indonesian tourism during the 2018 Asian Games. 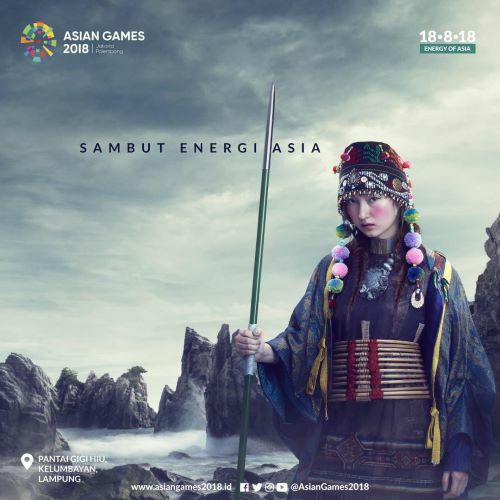 As reported by kompas.com, the images, which are intended for billboards, also feature models adorned in traditional attire from countries participating in the Games. “The initial idea was to welcome the different Asian nations to […] Asia’s largest sporting event. 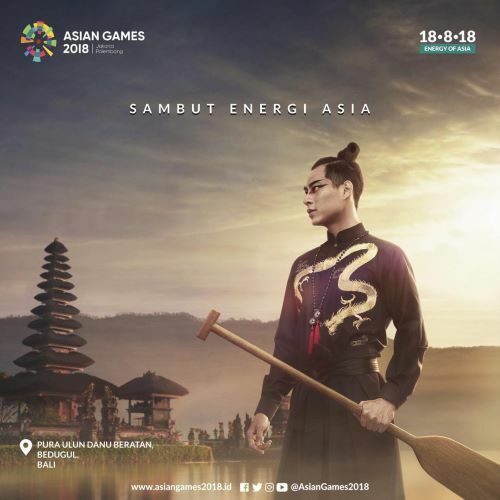 We use this moment to introduce Asian faces to society,” Ade Irawan from the Indonesian Asian Games Organizing Committee’s (INASGOC) communication department said, as quoted by kompas.com. These are the six destinations featured on billboards in celebration of the Asian Games. The Borobudur temple is a cultural and religious tourist destination, which is listed as a UNESCO World Heritage Site. Located in Magelang, Central Java, Borobudur is one of the most recognized icons of Indonesian tourism. To dive into the culture, travelers to the area can also choose homestay accommodation to remain near the site. 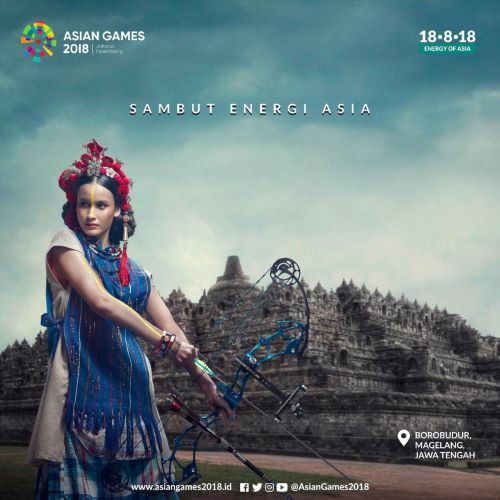 The Asian Games billboard for Borobudur features a model wearing a Southeast Asian-inspired costume while representing the sport of archery. With a costume inspired by several cultural elements from across Central Asia, another image is set on Lampung’s Shark Teeth Beach. Located 90 kilometers from Bandar Lampung, it is the unique pointed rocks have earned the beach its name. The next image features Pura Ulun Danu Beratan, a temple compound in Candikuning village in Bali. Located approximately 50 km north of Denpasar, the temple is surrounded by a serene lake. Ulun Danu Beratan hosts five temples inside its premises, namely Agung Penataran, Dalem Purwa, Taman Beiji, Lingga Petak and Prajapati. Meanwhile, the billboard features a model wearing an outfit inspired by East Asian culture while he holds on to a paddle. Tana Toraja is located in South Sulawesi and is a conservation area of Proto Melayu Austronesia that is still well preserved. A visit to Tana Toraja is not complete without visiting the burial site of the Toraja people, which is set on a rocky hill. Toraja culture upholds many traditional ceremonies set against a background of natural beauty. 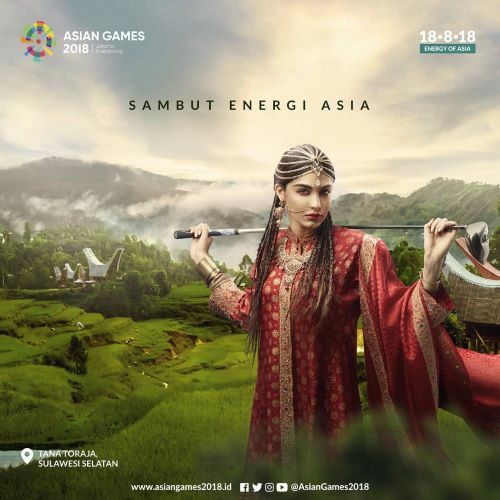 For the Asian Games image, the model wears a South Asian-inspired costume while holding a golf club. Toraja’s rolling hills and traditional houses can be seen in the background. Padar Island is one of the islands that make up the Komodo National Park in East Nusa Tenggara. The iconic bay featured on the promotional image is one of Indonesia’s most recognized spots of natural beauty. Padar is one of the islands where travelers can see komodo dragons in the wild, aside from the neighboring islands of Komodo and Rinca. 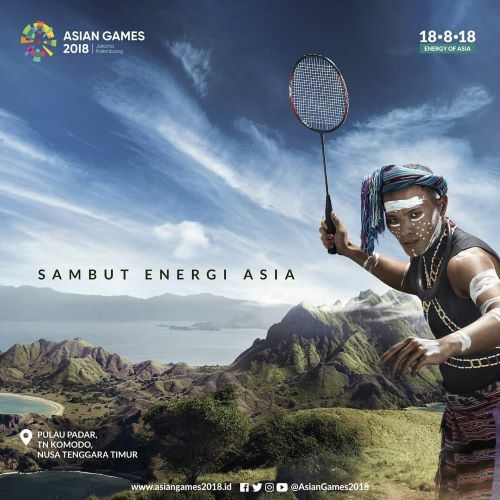 In the Asian Games image, tribal elements inspired by several cultures of Southeast Asia define the costume of a model carrying a badminton racket. Mount Rinjani in Lombok, West Nusa Tenggara, one of Indonesia’s seven highest summits, is listed as a UNESCO Global Geopark. The hiking destination, popular among local and foreign climbers, invites visitors to enjoy beautiful views of Segara Anak Lake, the hills as well as the sea of clouds on top of the mountain and the beautiful crater. On the image, the model, who carries a bicycle, wears garments inspired by the Middle East.